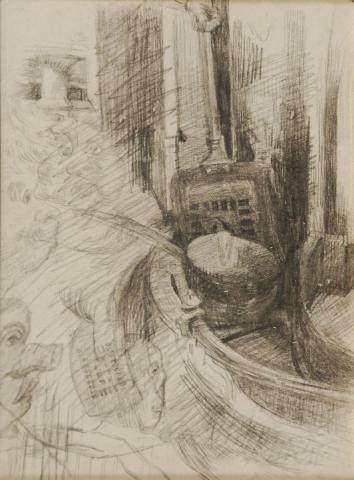 The Royal Museum of Fine Arts in Antwerp (KMSKA) bought the rare drawing 'Fireplace utensils and masks' by James Ensor at a Brussels auction. It deals with one of the famous ‘hybrid' drawings of which only a dozen or so are known. They belong to his most innovative drawings. The KMSKA possesses the richest and most representative Ensor collection in the world. A drawing such as this one, sold at auction by Brussels Art Auctions, was still lacking though. Of this sort of drawings there are only about a dozen known. A few of them are in museums (The Art Institute of Chicago, inter alia), and a few of them are in private collections. It was from one such private collection that the KMSKA purchased the work. 'Fireplace utensils and masks' (black chalk on paper, 22,2 x 17,5cm) sold at auction for € 55.000. The KMSKA paid the sum with money that it raised via its own income, sponsorship and gifts.